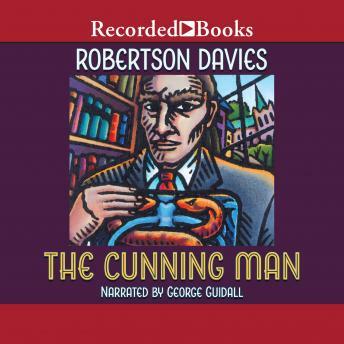 For years, Robertson Davies has won acclaim for his warmth and wisdom, humor and bravura. Now Canada's leading man of letters crowns an astonishing literary career with a novel in the spirit of his best-selling Murther & Walking Spirits. 'Should I have taken the false teeth?' This is what Dr. Jonathan Hullah, a police surgeon with 'a high degree of cunning,' wonders after he signs the death certificate for St. Aidan's Father Hobbes.What made the good father drop dead while celebrating Communion? In his search for the answer, Hullah whisks us back on a tour of his own rich and colorful life. From his adventures in the Royal Canadian Army to his relationship with a butter sculptress, from his medical secrets to his circle of friends-including outrageous banker Darcy-Hullah revels in the divine comedy of life and, not incidentally, solves a murder. The Cunning Man is enormous entertainment from the first Canadian Honorary Member of the American Academy and Institute of Arts and Letters.